Well the pics tell the story but here goes for some more details. I put all the flour and the yogurt and maple syrup with the YW/Water mix together with just enough spatula work to get it wet. Placed covered bowl in the oven with the light on and door propped a bit open so warm but not too warm. Left it several hours till puffy and the young levain was also puffy and full of bubbles. A note about this. 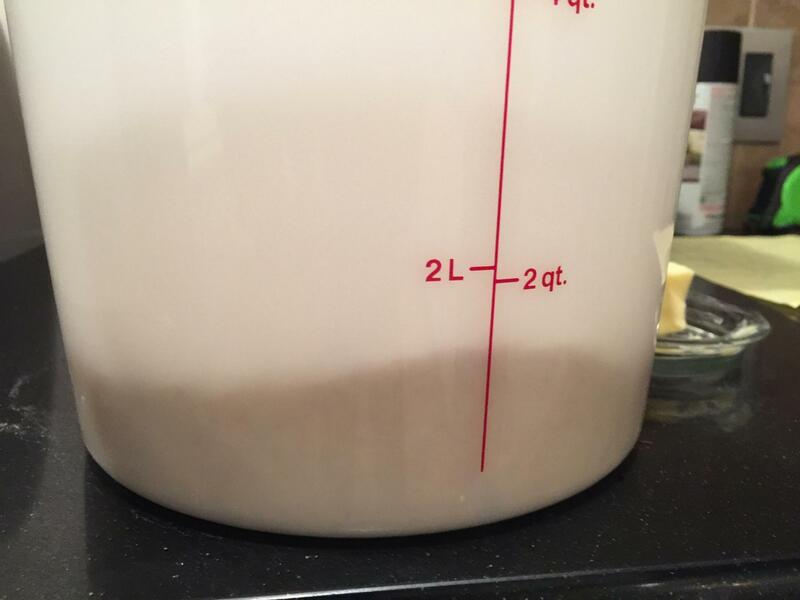 I took the 160 g water and 160g spelt flour and added it to 18 grams very firm rye starter from my NMNF cache. I did not do multi feedings I did nothing...mixed it and set it in the warm oven with the bowl. 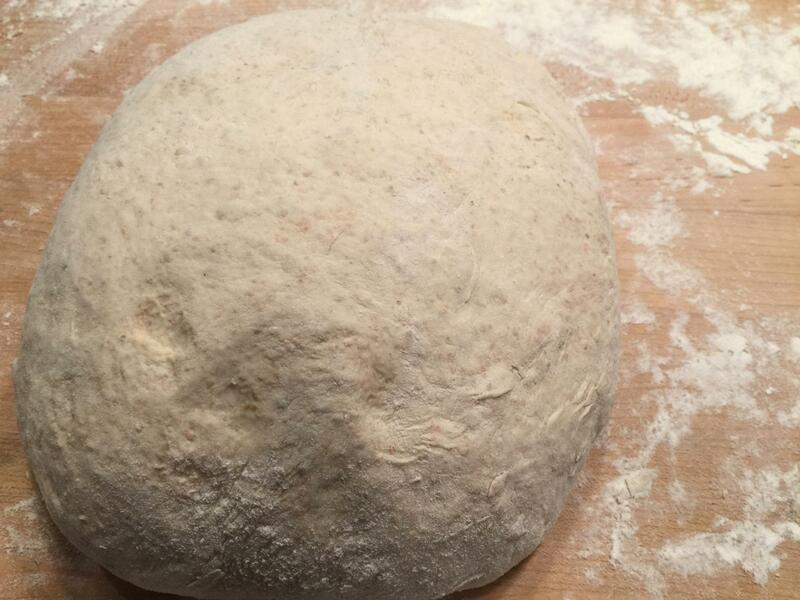 I removed the bowl and sprinkled the salt on the dough and sprayed it till quite damp with water. I then did about 30-40 gentle turns with the spatula just to get it folded in. I folded in the levain using just enough gentle turns to get it mixed in. I then covered the bowl and placed it back in the warm oven. I waited a couple more hours. You can see the bubbles on the dough. I scraped it out onto a well floured counter. I did two s and f one right after the other....that was it...Nothing, absolutely nothing else. I placed it in the oiled container and DID NOT leave it out anymore. I placed it directly in a cold fridge. You can see it easily doubled and more by this morning. I removed the cold dough from the container. Divided into two 800g pieces. The rolls were barely shaped while cold to preserve the puffiness so somewhat free-form. The batard was also barely touched. 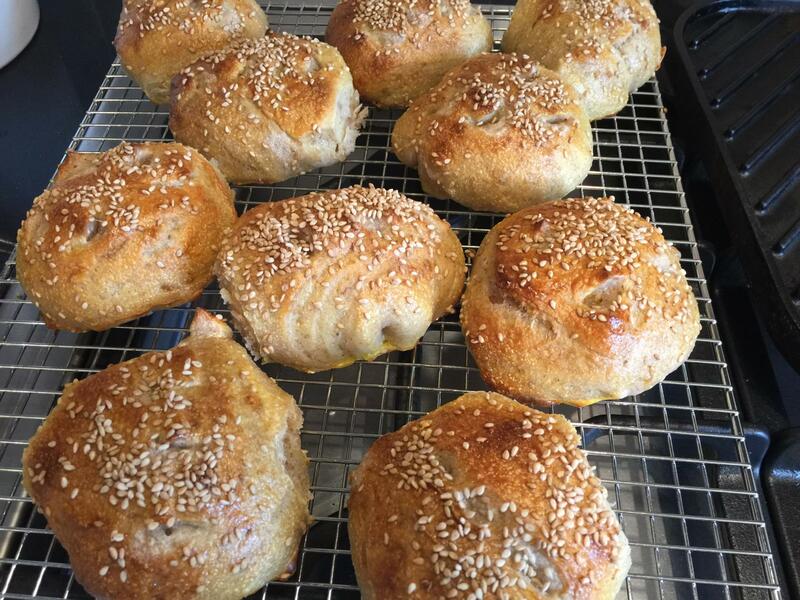 It was cold and all I did was lightly sprinkle the seam side with coarse rye flour . I then pinched the seam together. No preshape, no rest, no shaping at all. Just folded the edges together and pinched. Placed seam side down in rice/flour banneton. Plastic bag and into the oven with light on and the pan of rolls. Left to rise one hour. Baked the rolls first at 500 for 10 min and 475 for 10 min. 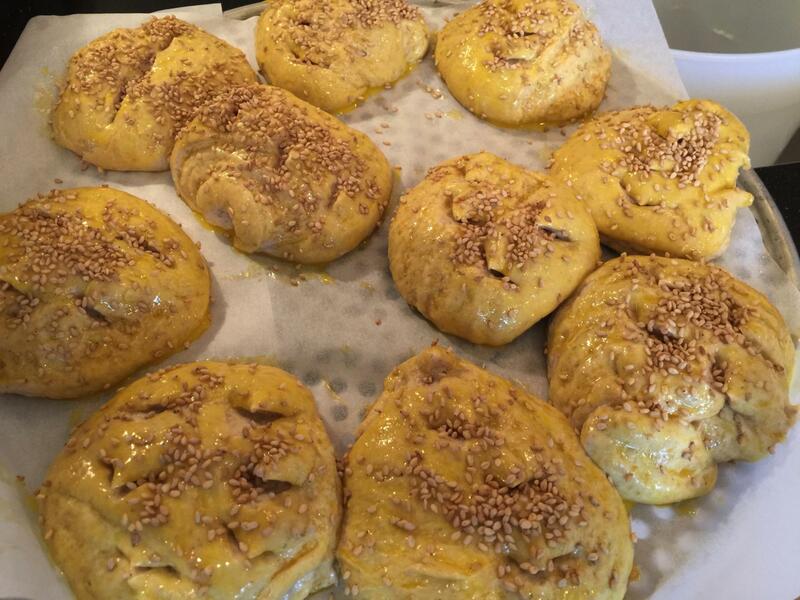 They are brushed with egg yolk/half and half and sesame seeds sprinkled on. Misted a couple times with water in first 10 min. They are amazing...had a ham and cheese on one and husband had house cured pastrami from our son...so yum !! The batard was baked in my trusty roaster that was preheated 10 min at 500.Loaf turned out on parchment and lowered into hot roaster. Loaf baked with two ice cubes for steam thrown in bottom of hot pan for 10 min at 500 lid on, 10 min at 475 lid on and 20 min lid off. 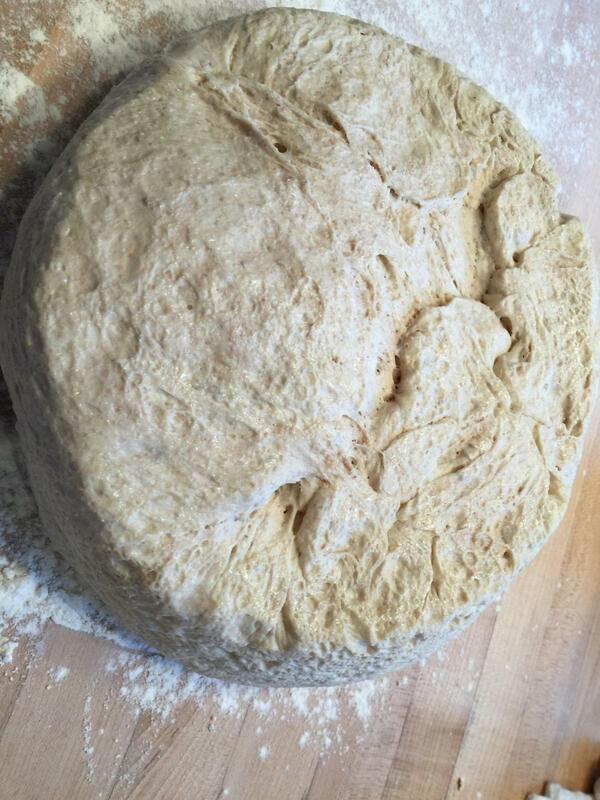 Crumb shot of bread will be tomorrow...I am taking it to our Buddhist meditation get together. I hope this lenghty description will help to further the " almost no hands on" technique of gluten development. It has certainly converted me. There is no reason to do much of anything. Nature takes its course with little interference. I have a fig/raisin banana yw that will have cinnamon in it to see how that does with the no hands treatment. More to come tomorrow. I love this method. I do need to try it one day when I am not making 12 loaves at once. I guess I don't know what is stopping you from making 12 loaves with this method. You can do 6 easily in one bowl and 6 in another. Or just use 4 bowls and follow this method. Mix everything in the bowls and cover with the shower caps and set aside...come back fold in salt, cover...come back and fold in levain...cover ....do the two s and f and retard. Shape and rise for only one hour the next day in your banneton. Way easier to retard the buckets than to retard the separate 12 loaves and you can shape them the next day cold...since there is almost no shaping involved. I hope you will give it a test run. Will save you so much time and still give you a very lovely bread. I don't have particular bread planned for next weekend. I might as well give it a shot. Hubby found raisins that didn't have any oil so I will get those going with some apples and ginger to make yeast water. By the way, what is your room temperature and what is your fridge temperature? It prevents mold on the fruits and extends the life of the fruits as well as adding a lovely nuance to all YW. I put it in no matter what fruit I am using for the base. Also when you change fruits just spike the batch with a splash of your maintained apple yeast water and then convert to the fruit you want...just like with your SD starter. Orange peel! Why did I think it was ginger? I must have been thinking of the Kombucha for its second fermentation. This place is going to be looking like a fermentation factory between the yeast water, the Kombucha and the sourdough! I had to give up completely on trying to have real kefir as it kept changing over to Viili....which I actually like as it makes a great soft cheese...hm....maybe I need to get kefir grains from someone again !! but I have done crème fraîche! Crème fraîche is so expensive that’s it’s worth making it plus it is so easy. Just stir a spoonful of commercial crème fraîche in two cups of heavy cream and let sit in a warm place for 24 to 48 hours. Save a spoonful for the next batch when you get to the bottom. I use it in Tarte flambée, which is a Type of pizza/flatbread. 1. There are no amounts as I didn't measure. I scooped a heaping soup spoon of each the crème fraîche and Greek yogurt. Next time I will use more crème fraîche and less yogurt. Add a drizzle of oil, pepper, and grated nutmeg. For salt, consider the pancetta. In some cases, it is not needed. Mine definitely needed more salt. 2. Do not cook the onions or pancetta ahead. They will brown nicely on the grill. 4. Spread the crème fraîche mixture over the dough leaving an edge of 1 cm. Sprinkle onions and pancetta evenly over the sauce. 5. Cook in the oven or on the grill with the lid closed. It is done between 8 and 10 minutes. Edges should be nicely browned, onions are soft and just starting to brown and pancetta has crispy edges. Serve hot. I could get my hands on the real stuff. Safeways carries it here. And you do have to try the tarte flambée. We had a pizza party last fall at the barn and they are still talking about the tartes flambées that we made. You are so lucky to have a son that is a charcutier! Love thus bake and your hands off method. Time to get a YW going again. 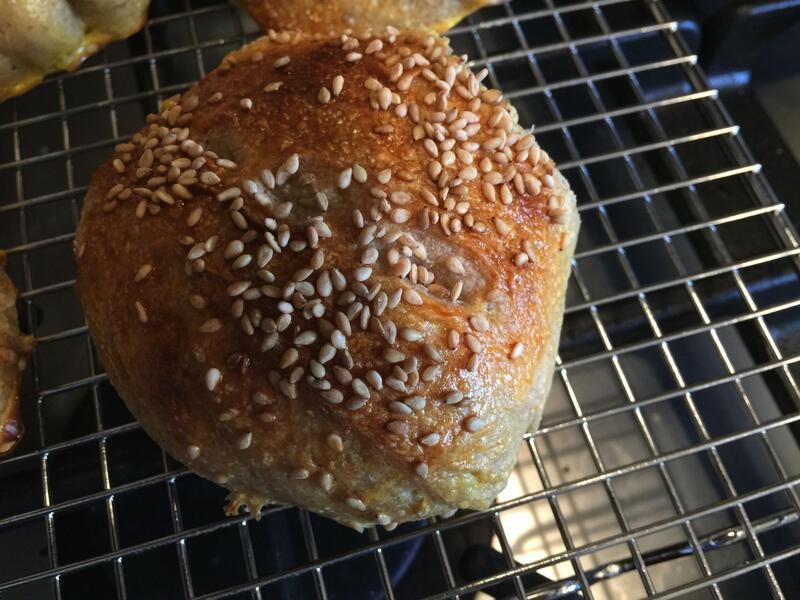 Have you made a levain with the YW instead of using you SD starter? amazing bread. There is some variation in color of crumb so will have to see about making sure the levain is incorporated completely. The new YW is started last night. Using orange segments and some peel. Hopefully by next weekend I can bake something with it as I'm traveling most of this week. The batard is beautiful...a lovely dark, delicious looking crust! 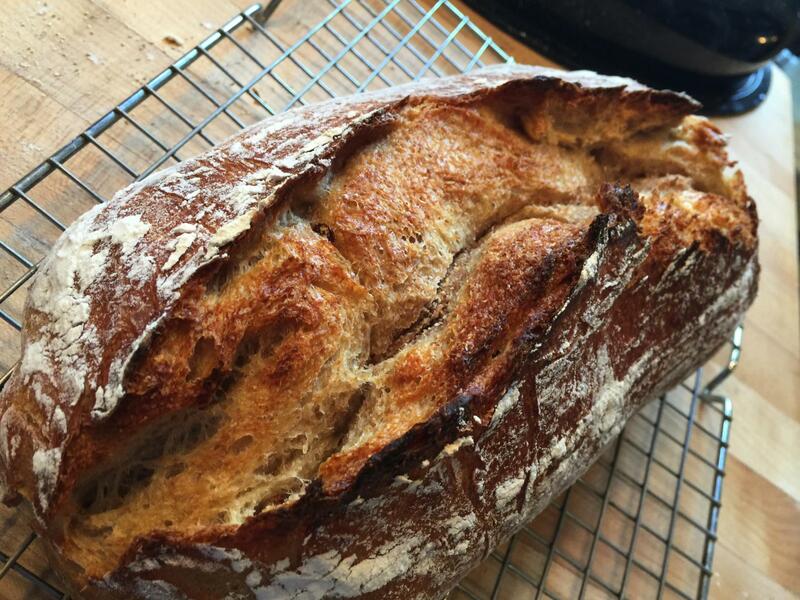 I am curious as to why you decided to use both AYW and a spelt levain? 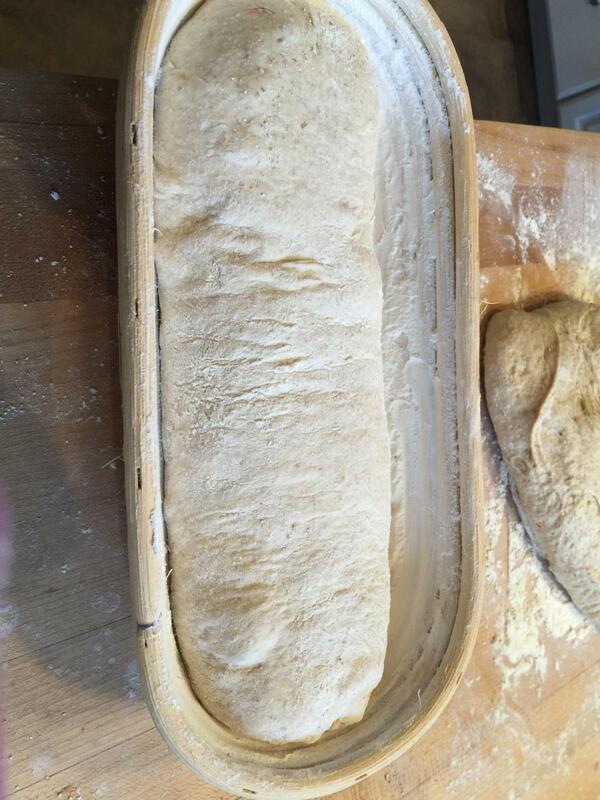 As well as being less sour what other characteristics does this mix produce in the finished bread...apart from being rocket fuel for the proofing dough! Very nice bake Trailrunner. I just love YW...there is a special fragrance to the bread when it is used and if you vary the fruit I find the taste does come through with some . Banana/orange especially. I keep a fresh piece of orange peel in all of my YW at all times . It keeps it a bit acid and prevents any mold as well as keeping the fruit fresh longer. The bread will keep way longer when YW is used also. 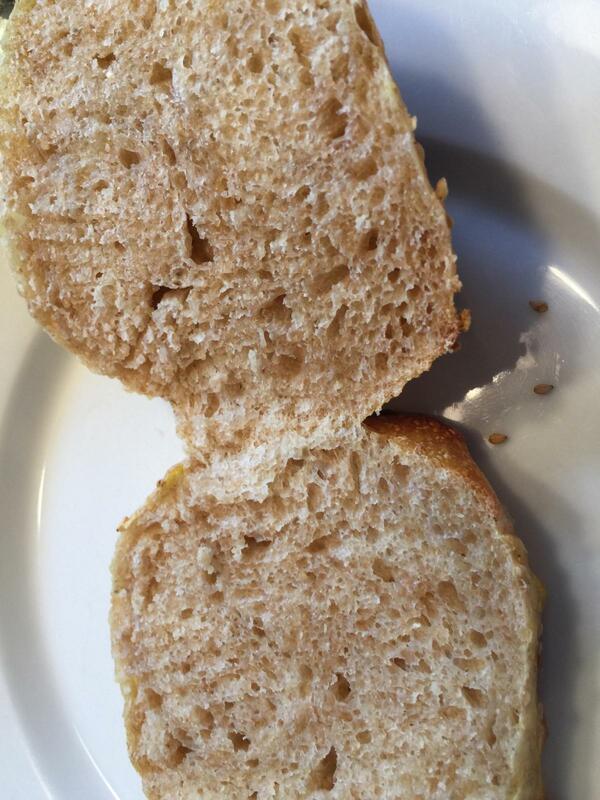 Sourdough is not really very good, at least to me after about 2 days...except as toast. With YW the longevity is greatly extended without harming the crust . 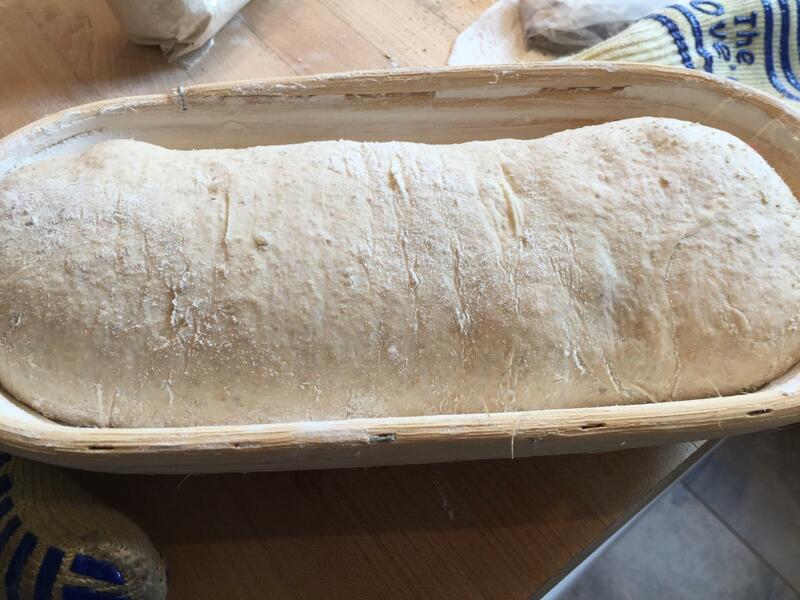 Love the method and the loaf! Well done! YOU ! thank you ! Have been traveling for work but that's over for a while.. so hope to get back at it soon! 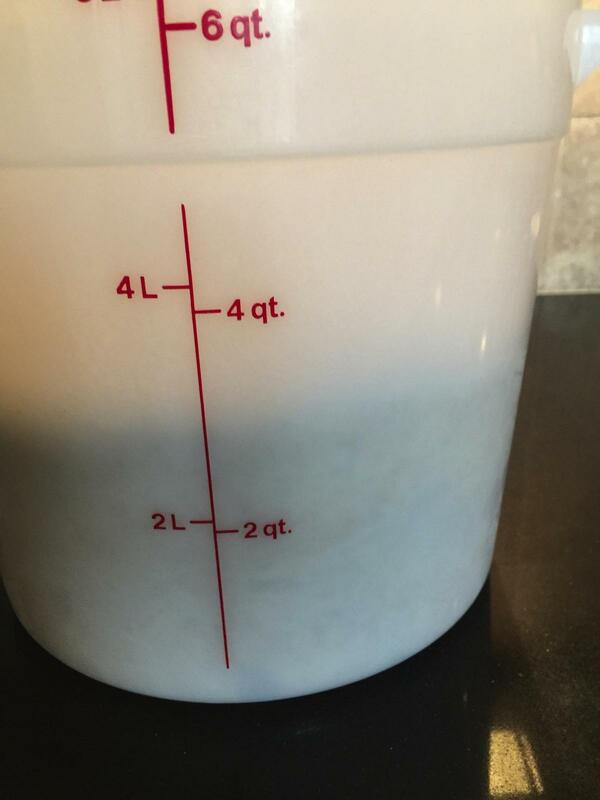 After reading this post I have finally succumbed to the idea of making some apple yeast water, and so will have yet another thing to feed. 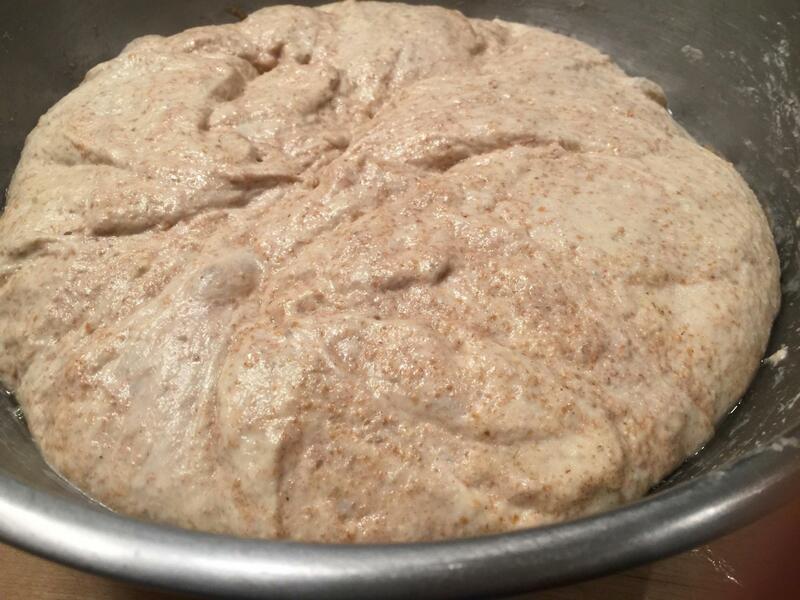 I'll do some research this week to see how to get started with the yeast water - the bread-keeping qualities and that fragrance you described got me hooked. a lot easier than raisin I think. Just sterilize a quart jar and lid. Get a Granny Smith organic apple. wash it and cut it small dice. Place it in the jar and cover with water add a large piece of orange peel. Place the lid on loosely. Place in a 80 degree F place. Take off the lid and stir it several times a day. It will start to make bubbles and smell like apple cider. 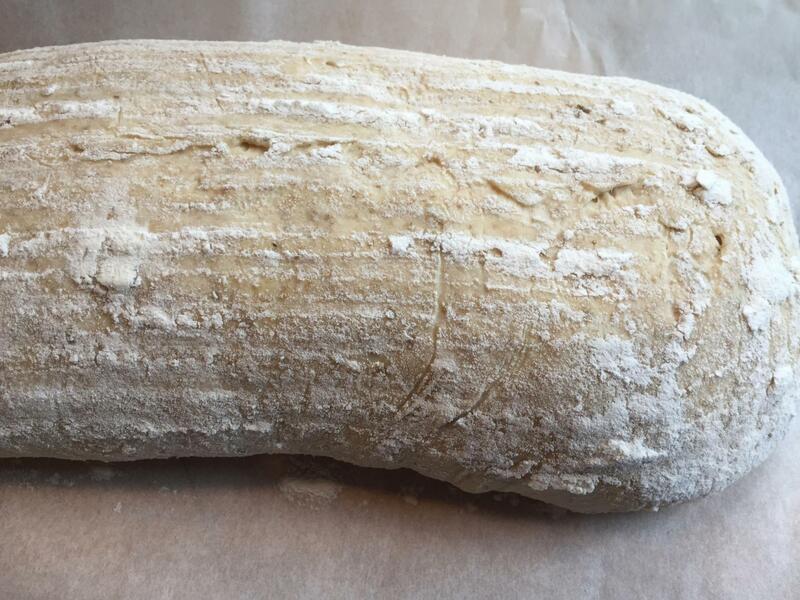 It takes about a week before it is ready to bake with. Make sure and stir it several times a day and keep it warm. When a week or so has gone by you can mix = amounts of flour and AYW and place it in the 80 degree environment and see if it rises to double in a few hours. If it does then it will rise your bread. To maintain the YW all you do is store it in the fridge and when you use water out of it add back the water. When the apples sink take them out and need to add only a 1/2 an apple cut up. It doesn't have to be organic any will do. If you want to change up fruits all you do is take out a bit of the apple YW and add some water and a new fruit, such as a 1/4 banana sliced to a pint of water . Voila...new YW in less than a day. YW loves bananas !